I kept getting dropped from the call, the only participant to have problems. The audio was not clear. I’ve been using join.me for yrs, and had no problems. 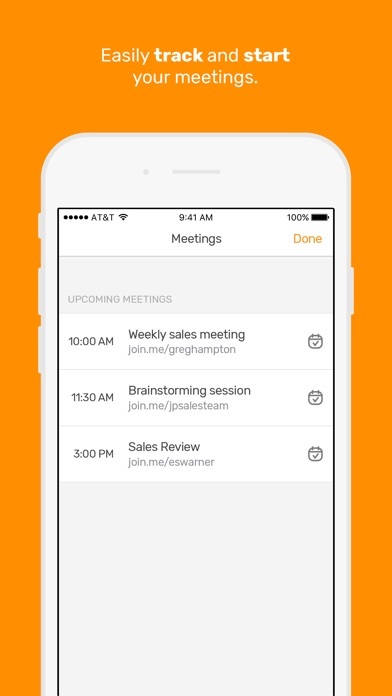 Just got the app for my phone, and scheduled my first meeting with it. Invitation that was sent to other participants had a different conf ID than the one used every single time since I’ve had the service. That alone is bad enough, but to make it worse, conf ID sent is not the same as the one listed on app? 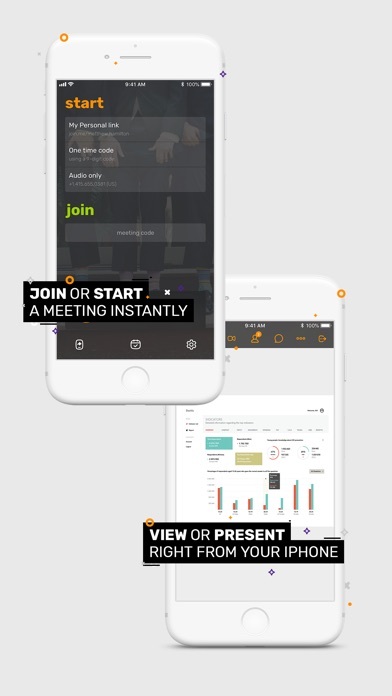 How about being able to view all future meetings that have been scheduled in the Meetings section. Currently you can only see today’s meetings. This is either a bug, or very shady. I have headphones in, and the UI shows the volume going down but the volume never goes down. I have very sensitive ears and hearing loss is very real in my family to the point that my mother has 90% hearing loss, I hope not to have that but this silliness of not being able to turn the volume down is not cool. After two years of use the quality and performance of this app has really gone down hill. The app crashes with every use. We are now looking for alternatives. If you want support-FORGET IT. If I could give it 0 stars, I would. Works great, but there are two big gotchas with the user experience. First gotcha: joining the meeting is not enough! It is a TWO STEP PROCESS. You begin with NO AUDIO, unless you remember to also click the phone icon, and connect there as well. This should have been integrated. Second gotcha: YOUR MICROPHONE BEGINS HOT! You must remember to mute your microphone. Should have been a single tap of a top-level icon to do this, as it is a common user task, but instead it takes many clicks into a sub-menu to mute and un-mute. Third gotcha: NO BLUETOOTH. Just phone speaker. Crank volume all the way up and hope you can hear. There is no audio selection menu, so no way to route the audio to another device such as a headset or Bluetooth speaker. This app would really be useful if you could schedule future meetings from it. GoToMeeting does this - why not here? Everything coming from the app is far too loud, I have the volume on minimum and it is still very loud! It cannot join a meeting, it just crashes every time. Every time I tried to join the meeting, the app crashed. Tried from two different devices and accounts with the same issue. It is great to be able to feel I am right there with my client! Downloaded the app first time.... couldn’t get it to work. Why have an app, if it’s not intuitive? I've used join.me in the past, but after setting up my first board meeting conference call, I found it to be lacking in consistency. No longer works after update..... Just a white screen. One star. Update: they updated it again today, 5/17, and it's working as normal! Back up to 4 stars. You can't share the screen. I mean like, wasn't the main point of this software sharing the screen? It's stupid to make it so you can only share it on the computer, irritating, and a waste of time. Issues with all of their apps on various devices: Whiteboard was not functional: I created a whiteboard and saved it in my account for a presentation. Could not use it once my clients logged on to the meeting. Not all of my clients could get logged on sometimes. I had trouble logging on myself sometimes. My video feed would stall-out in the middle of a meeting and go into audio only, or sometimes nothing at all. Rude customer account rep: I had a very prompt customer service person who followed up with me regarding my issues, and assigned an account Rep to me. I was sent a confirmation of a video meeting with this Rep to review and test my issues, so we could resolve the problems. They booked the wrong time in their system. So on that day, when I called in for my video meeting, the Rep kept me waiting. Then got on audio only and he explained there was a mix-up in the time (even though I sent a detailed confirmation email to make sure) so he told me to come back for our meeting in an hour at 2 pm. He would send me a new link to log on via email. So I waited, and waited with my email app OPEN. finally at 2:04 pm I received his link. The link wouldn't open on my first device. So I went to another device and opened the link there. I waited for this Customer Account Rep for 40 minutes. HE NEVER SHOWED UP FOR OUR MEETING. Now I lost two hours of work, and nothing was resolved. I sent a choice email expressing my dissatisfaction, and he had the nerve to tell me I was late for the meeting and he left the video meeting after a few minutes.... ....Well, let's see... I'm calling you cause your app stinks and doesn't work properly, YOU screwed up our first scheduled meeting time, YOU set a new time, and YOU were late getting me the new meeting link, and I had problems logging on to the app which was one of the reasons I was calling in the first place, then YOU have the nerve to say I'm wasting your time? So glad I test services like yours on a very small group within my company, long before I test run it again with my vendors, groups & clients. You and your app was already an embarrassment and I was only in your TRIAL stage. Your rude behavior saved me a lot of time. Thank you. I went over to ZOOM. So far they have been GREAT. Join Me charges $19 per month for what I wanted, but Zoom offers those same features for FREE, and their same price point at $18 per month has even more features than Join Me. Stable service, no issues. I even attended a Zoom video confrence on the road while traveling from Minnesota to Illinois with no issues! Very happy with ZOOM now. I can’t begin to count how many times I have missed meetings due to the absolutely absurd mobile app login experience. First, it randomly forgets what is stored on your device and you end up having to re-login to your account. But if that was not annoying enough.. When you login, you are subjected to a CAPTCHA challenge on your mobile device. I mean **really**? How can robot software use my iPhone to attempt to break into this system? But it gets better. The CAPTCHA is presented not just once with a bunch of fuzzy images, but does the image replace thing. It is like a finish line that keeps on moving. But it gets better... Then after you complete the first infernal CAPTCHA challenge, it will commonly throw up another one. Two or three is the regular, not fun on an iPhone. And by that point you have probably joined your meeting very late *if* you cleared the hurdles. And then somewhere down the line, it forgets your stored credentials and you do it all over again. But that is not the worst part... The worst part is when you invite someone else and they sign up for an account and get hit with this CAPTCHA nonsense in the mobile app. I have had attendees refuse to join and only dial in because of this. Avoid this app. It is amazing and easy to use. Thanks a lot. FOR A BRISK 3 DAY TRIAL! We have used Join.me since it came out, awesome, easy to use. We have Pro edition & love it. We are a heavy webinar user. While participating in a presentation, the audio has to be disconnected and reconnected 2-3 times in a typical 30-minute meeting. Very inconvenient. Zamurai whiteboard on the iPad was an awesome tool for using your iPad as a tablet to whiteboard during meetings. 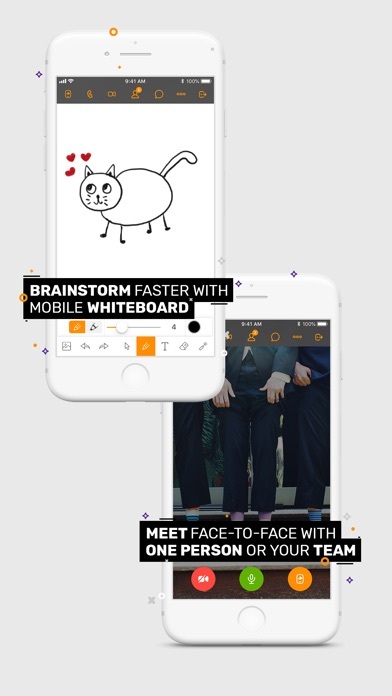 The whiteboard app is still great, but it's been taken hostage by a $240/year subscription meeting app in join.me. Oh well, time to look for the next whiteboard solution. Thanks for breaking a great app, join.me. I have been having a lot of issues with audio while I'm on a call. If it's through internet I see that I loose it a lot more frequently. I miss some things that are being discussed because, I then have to call in via phone. When I first got the app it did not do this. It has happened a lot more frequently now. Taking my time for 15 minutes and then out of nowhere coming up with this say that they can't help with our business though he was just walking me through with a sample of same business.. so unprofessional!!!!!!! I use join.me for work at least a couple times a week and it has transformed how I run meetings. I have used it on both laptop and IPad and had no problems with it. The flexibility of the app has been great whether I am just using the whiteboard and stylus or typing things out with a mouse and keyboard. Would definitely suggest others to take the time to utilize this app because it is a life saver if you REALLY don't want to have to drive X hours just to make a 1 hour meeting. My favorite meeting tool, by far! In my job I work with other companies, many of which use other meeting solutions like WebEx or GoToMeeting. I prefer join.me because it is so much easier to meet, and it's fast and simple. Plus, I get the best whiteboard for my meeting so people can see what I'm thinking. Thanks and keep up the good work! I use this app frequently and generally find it works well but it is prone to crashing. I would enjoy a more stable version. Audio great Screen view as good as any other app. Really like the way attendees can log in using your name as opposed to just numbers. I just needed to share my desktop, which is running a program with a polygraph, to my smart phone. This app is just what I needed. This screen share app stays open on the computer until it is turned off, also exactly what I needed. My streaming polygraph needs to be accessible at any time over a six day period on my smart phone. On the smart phone side, the "reviewer" mode tends to shut off after so many minutes or hours. I have not figured out how long this desktop to smart phone "sharing' can last before the connection interrupts. Interestingly, the developer's site does not mention how long the "meeting" or screen sharing will last for each session. Is the sharing duration for each session supposed to be unlimited, even for the free version? This information is basic but is not mentioned anywhere on the developer's website or on the internet! Great app!! So easy to use! It was working great until the upgrade to iOS 12. Since then I cannot get anyone to join the meeting hosted on the iPhone. That allow screen pops up and disappears immediately before I can click it. I can’t do screen sharing on the iPhone now which is why I got in the first place Updated- it lets people join but ends the meeting immediately with the reason "stop sharing ". This is an app I pay for every month and it’s frustrating that does not work please fix. 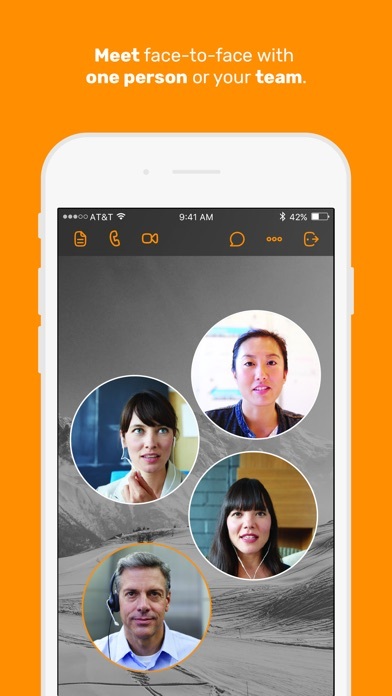 Pretty annoying for a conference call app. I Use this extensively at my small company as a year or so ago the service was great. Now I can count on getting dropped from my meetings 2 - 3 times per hour. If you rotate your phone while on a call with this, it will crash. Even if you hold your phone very carefully and still, it will crash pretty reliably every 10 minutes or so. Extremely upset given how quality join.me used to be and how much I pay for the pro service for my company. No fixes in months, and I'm disappointed to see yet another update that doesn't fix any of these common issues. I recommend trying one of their many competitors before signing up for this service. They could hear me but I could not hear them. Unbelievably bad performance- I can't comment on how it works because I never got that far. 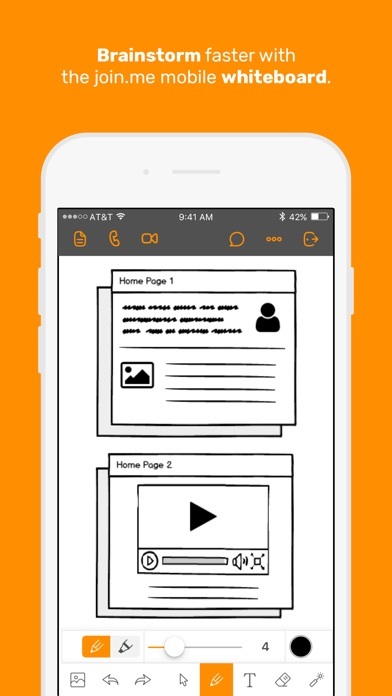 App would only appear for 10 seconds then disappear using the webinar code. Attempted to sign up only to have it "load" for 5 minutes and never complete the task. 30 minutes of effort and a missed work webinar leaves me with only horrible things to say. Join me is intuitive and effective for large meetings and presentations. It lacks a feature to identify and mute a noisy line. The bigger the meeting, the more often this occurs. Only 3 people can join a stream?? Really?? I counsel my business colleagues to avoid Join Me and other LogMeIn services. Their sneaky business practices inevitably lead to unexpected non-refundable charges with no advance notification given. Buyer Beware: Serious Business users ought look elsewhere. Join me cannot achieve ease of use. It’s by design. They have fallen into a trap the customer without providing value. Thanks for adding iOS screen sharing. Excellent feature addition. Keep up the great work. Please consider adding Apple Watch support for common commands. I use AirPods for all my calls so a mute option would be really nice.